Alarming national headlines related to opioid addiction highlight a public and mental health emergency across America. Overdoses and opioid-related deaths are skyrocketing (Rudd, Seth, David, & Scholl, 2016; Skolnick, 2018; Suzuki & El-Haddad, 2017), and the lifespan of many Americans, especially in rural areas, is declining for the first time in generations due in part to maladaptive use of narcotics (Katz, 2017a). Opioid painkillers are the most frequently prescribed class of drugs in the United States (Skolnick, 2018). Misuse of these drugs often leads to the use of heroin, a cheaper and more potent alternative to prescription painkillers (Skolnick, 2018). Heroin is increasingly cut with the synthetic opioid fentanyl (50–100 times stronger than morphine) and its various analogs, such as carfentanil (a veterinary drug used to rapidly immobilize wild animals; Suzuki & El-Haddad, 2017), contributing to the recent dramatic rise in overdose deaths (Katz, 2017b; Suzuki & El-Haddad, 2017). The opioid epidemic also is associated with increases in a host of other negative outcomes, including rates of HIV and hepatitis C, arrests and incarcerations, and neonatal abstinence syndrome (Skolnick, 2018). Addictions, mental health, rehabilitation, and school counselors are challenged to find better ways to understand and assist users, families, and communities being ravaged by this public health crisis. 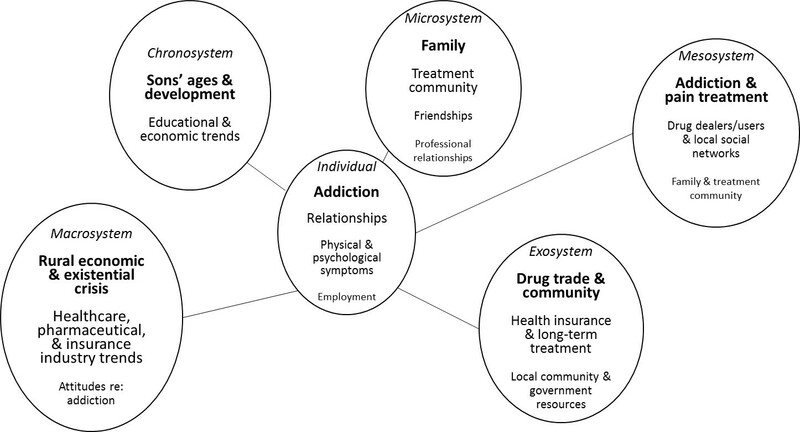 Clinicians and researchers have developed multiple individual and community-based strategies to assist clients with substance abuse, but current circumstances have underscored the need for members of the counseling profession to take a more comprehensive and ecological approach to both understanding and addressing the needs of people struggling with opioid addiction (Dasgupta, Beletsky, & Ciccarone, 2018; Hewell, Vasquez, & Rivkin, 2017; Keyes, Cerdá, Brady, Havens, & Galea, 2014; Kolodny et al., 2015). In subsequent sections, details of this public and mental health crisis are described, and an ecological case conceptualization model that utilizes eco-mapping to assist counselors in better understanding and developing systemic treatment plans is presented. A case study allowing for the application of the model is provided, and implications for counselors are explored. Mental and public health officials have long recognized the popularity and uniquely addictive potential of substances classified as opioids. Use of opium and morphine first became a problem in America during the late 1800s (Kolodny et al., 2015). Morphine was used to treat a variety of chronic and acute ailments, including diarrhea and injuries sustained in battle. Smoking opium recreationally became popular in some circles, and physicians also inadvertently addicted their patients by prescribing opioid treatments. As medicine and public health advanced, more diseases could be avoided, cured, or treated without the use of highly addictive opioids, and their use fell out of favor by 1919 (Kolodny et al., 2015). In the second half of the 20th century, heroin addiction intermittently rose to epidemic levels among disadvantaged urban populations, especially in the large cities of the northeast and west coast of the United States (Kolodny et al., 2015; McCoy, McGuire, Curtis, & Spunt, 2005). More recently, the introduction of synthetic prescription opiates (e.g., Vicodin, Percocet) in the 1980s and the approval of sustained-release oxycodone (brand name OxyContin) in 1996 brought pain relief to millions of users, but has contributed to high levels of abuse and dependence nationwide (Van Zee, 2009). To understand the addictive nature of opioids, counselors must account for the acute effects of their use (e.g., relief from physical and psychological pain), unique side effects (e.g., opioid-induced pain sensitivity, painful withdrawal symptoms), ease and speed with which tolerance is established, and potential resulting impairments in daily functioning (Kosten & George, 2002). When opiates bind with neural opioid receptors in the brain, spinal cord, gastrointestinal tract, and other organs, they inhibit the release of pain signals, blocking the user from experiencing both physical and emotional suffering. Some people are naturally more vulnerable to developing opioid tolerance (taking more drug for the same effect) and dependence (drug required to avoid withdrawal; Kosten & George, 2002). Susceptibility is influenced by a variety of biopsychosocial factors (e.g., brain structures, cellular differences, context of use, stress). In a study examining opioid prescribing patterns, 25% of patients who had a new opioid prescription progressed to receiving additional prescriptions episodically or chronically (Hooten, St. Sauver, McGree, Jacobson, & Warner, 2015). Nicotine addiction, overall poor health, psychiatric diagnosis, and history of substance abuse were found to increase the likelihood of ongoing opioid use. Withdrawal symptoms lasting three to five days—including nausea, muscle cramping, body aches, anxiety, and inability to sleep—can compel users to obtain immediate symptom relief via the use of additional opioids (Kosten & George, 2002). In an attempt to avoid debilitating withdrawal symptoms, users become reliant on the drug to function at a normative, baseline state. Although the pathway to opioid abuse and addiction is not new, a culmination of ecological factors over the last 20 years has led to what is now commonly referred to as a national epidemic (Kolodny et al., 2015; Skolnick, 2018). These factors include changes in prescribing patterns, increased supply, rampant growth of illicit use, the progression to intravenous heroin use among chronic users, and the lethal contamination of heroin and fake prescription pills with highly potent synthetic opioids like fentanyl, as well as broader systemic variables such as poverty and access to health care (Dasgupta et al., 2018). The dramatic increase in the availability of prescription opioids in the early 21st century stemmed, in part, from changes in medical attitudes and policies (Kolodny et al., 2015; Skolnick, 2018). Spearheaded by the American Pain Society’s advocacy efforts to have pain recognized as a fifth vital sign (along with temperature, pulse, respiration rate, and blood pressure) in the mid-1990s, the Joint Commission and the Veterans Health Administration formally endorsed patients’ rights to pain assessment management in 2000 (Kolodny et al., 2015; Skolnick, 2018). Helping patients avoid physical pain thus became a primary focus of medical care. During the same time period, Purdue Pharma provided financial contributions to multiple medical and patient organizations (e.g., the American Pain Society, the Joint Commission, the Federation of State Medical Boards) and lobbied to allay concerns regarding long-term use of prescription opioids in the treatment of chronic non-cancer pain (Kolodny et al., 2015). Methodologically questionable research studies were widely cited to minimize the perceived risks associated with long-term use and addiction. Sales of Purdue Pharma’s doggedly promoted, non-generic OxyContin grew from $48 million in sales in 1996 (316,000 prescriptions) to almost $3 billion (more than 14 million prescriptions) in 2001–2002 (Van Zee, 2009). Though the time-release formula was touted as a deterrent for misuse, users discovered the pills could be crushed and then snorted or injected. In 2000, Purdue released a 160 milligram tablet (up from the previous high dose of 80 milligrams) approved for use by patients who had developed opioid tolerance, further increasing OxyContin’s draw as a drug of abuse (Van Zee, 2009). An increase in opioid supply via both unwitting and unscrupulous prescribers was quickly followed by the rapid acceleration of opiate abuse across the country (Van Zee, 2009). Unlike other illicit substances (e.g., cocaine, methamphetamine, ecstasy), these pain-killing medications were prescribed by medical professionals and therefore assumed to be safe. Prescription opiates were accessible through doctors, family, friends, the internet, and on the black market. Long-term use of prescription opiates can lead to tolerance and eventual physical dependence, requiring a continuous supply of drugs and financial resources to purchase them. Users of prescription opiates have increasingly turned to heroin (Skolnick, 2018) as a cheaper, more readily available option to keep painful withdrawal symptoms at bay. With increased availability and visibility, many people now report that their opioid use started with heroin rather than prescription drugs (Dasgupta et al., 2018). The rise of the presence of illegally manufactured fentanyl in opioids available on the illicit market has had increasingly deadly consequences, with fentanyl-related deaths in the United States up 540% between 2013 and 2016 (Katz, 2017b). Average life expectancy is now declining among some segments of the population—unusual except in times of war (Dasgupta et al., 2018). Unlike other U.S. drug use crises that have disproportionately affected minority populations (e.g., crack cocaine), there has been a focus in this crisis on over-prescribing as the root cause, rather than the moral failings of individual users. This broader view may help destigmatize the current situation, but it is imperative to recognize that complex factors lead to susceptibility to all such crises. For instance, in areas particularly affected by the opioid crisis, mortality associated with alcoholism, drug overdoses, and suicide (known as “diseases of despair”) has increased as local economies have declined (Dasgupta et al., 2018). The devastation of individual lives, families, and communities resulting from this epidemic is clear, and the complexity of the issues it has engendered requires counselors to expand treatment strategies and interventions. In the next section, we review Bronfenbrenner’s (1979, 1994) ecological systems theory and present a strategy designed to help counselors both understand and intervene with clients and communities battling this challenge. Bronfenbrenner’s foundational work, The Ecology of Human Development (1979), described how a child develops within a series of interrelated systems. He posited that human development processes are influenced by individual characteristics, as well as features in one’s immediate and more distant environments. Over the course of a lifetime, development progresses through a series of increasingly complex and reciprocal interactions between an individual and the people, things, and symbols in their environment. Research designed to investigate this developmental progression is described as aligning with a process-person-context model (Bronfenbrenner, 1994) and is endemic in our current understanding of psychological health and illness. Drawing upon Lewin’s (1935) theory of psychological fields (as cited in Bronfenbrenner, 1979), the ecology of a developing person is described as a set of nested structures, one inside the other (see Figure 1). The innermost system, called the microsystem, was defined by Bronfenbrenner as the pattern of personal interactions and activities that occur face-to-face with a person in their immediate environment (Bronfenbrenner, 1979, 1994). These interactions include an individual’s family, friends, schoolmates, teachers, neighbors, and colleagues. The proximal processes occurring between family members in the microsystem are among the most frequently studied in the psychological literature (Bronfenbrenner, 1994). These close relationships have extraordinary power to normalize or stigmatize behaviors and to support or hinder optimal individual development. Examples of behaviors that may be supported or discouraged within a microsystem include child-rearing practices, therapeutic or recreational use of prescription medication, pursuit of educational or occupational goals, religious practices, and encouragement of relationships with persons or groups outside the immediate microsystem. The mesosystem includes the processes and connections occurring between two or more environments in which an individual exists, or the system of microsystems in a person’s life (Bronfenbrenner, 1979, 1994). Interactions between a person’s home, school, workplace, neighborhood, place of worship, or medical providers are described as occurring within the mesosystem. Examples of mesosystem processes include how the closing of a manufacturing plant where an individual was employed could lead to a decline in the condition of his or her neighborhood, or how patients of a local physician who frequently prescribes pain medication may experience an increase in the off-market availability of such medication within his or her neighborhood, family, or peer group. The exosystem is comprised of processes occurring between two or more environments, at least one of which does not include the individual of interest (Bronfenbrenner, 1979, 1994). Even though a person may not exist within a certain setting, outside events can indirectly influence that person’s immediate environment. Examples of exosystem processes include how a new local company’s practice of only hiring college-educated workers influences less educated workers in a nearby neighborhood, or how decisions by legislators regarding health care policy influence local hospitals and family decisions about medical care. 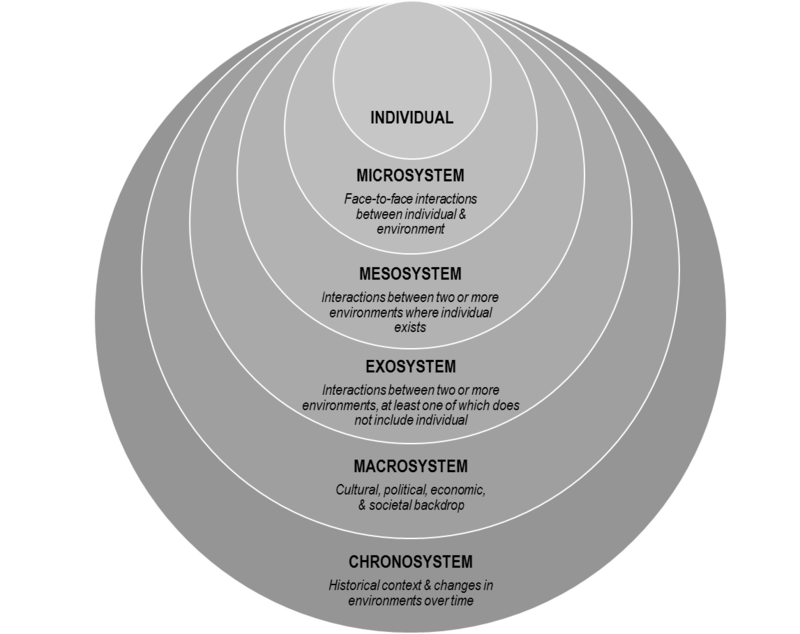 The macrosystem represents the patterns, policies, laws, values, and trends that comprise the broad cultural, political, economic, and societal/environmental backdrop of an individual’s life (Bronfenbrenner, 1979, 1994). Macrosystems include mega factors such as advances in technology and the rapid transition into the information age, the precipitous move away from manufacturing in the United States, the increasing need for a college education to obtain a salary that can sustain a middle-class lifestyle, changes in how health care is funded and delivered, the decline in membership in organized religious institutions, and a growing cultural emphasis on individualism. Other trends include changes in how information is delivered and consumed, and the increasing gulf between rural and urban communities. The chronosystem describes changes in an environment over time related to each of the other systems (Bronfenbrenner, 1994)—the normal growth and development of a person or family, the effect of a move or migrations of families or groups, and the effects of large historic events such as wars, natural disasters, and recessions. The chronosystem highlights that along with living within nested or interacting systems, a person also lives within the history of their own life—as well as within the history of their family, community, state, nation, and world (Bronfenbrenner, 1994). Ungar, Ghazinour, and Richter (2013) expanded Bronfenbrenner’s model in their studies of resilience to include a focus on the success of individuals and groups to secure resources leading to healthy development, even in adverse circumstances. Ungar and colleagues’ model describes systems as reciprocal rather than hierarchical. The effect of a systemic variable is not just related to its proximity to an individual (per Bronfenbrenner’s nested model as described above and in Figure 1), but rather on its importance to a particular person at a specific point in time. For example, a war and its related geo-politics (a macrosystem issue) may be much more salient than school (a mesosystem issue) for a particular child living under siege in Syria. A social-ecological perspective is tacit in many popular journalistic efforts focused upon the opioid use epidemic, including books (e.g., Hillbilly Elegy; Vance, 2016), documentaries (e.g., Warning: This Drug May Kill You; Peltz, 2017), and investigative news reports (e.g., Talbot, 2017). In these long-form examinations, a multitude of distal and proximal variables influencing opioid use patterns among individuals are described. Recent scholarly publications outside of the counseling literature have utilized implied (Dasgupta et al., 2018; Kolodny et al., 2015) and overt ecological (Hewell et al., 2017; Keyes et al., 2014) lenses to examine this problem. Keyes and colleagues (2014) undertook a large ecological synthesis of the extant empirical literature related to the opioid crisis in rural America. They identified the following risks in their analyses: (1) increased availability and access; (2) lower perceptions of harm; (3) self-medicating for pain; (4) more increased availability in rural rather than urban areas; (5) out-migration of young people (rural economic declines, and via selection effect, young adults remaining in economically depressed areas may have a greater number of risk factors); (6) differences between urban and rural social and kinship networks (importance of community investment, family ties, work over education, and local social capital in rural areas); and (7) structural stressors of modern rural living (unemployment and economic deprivation). In their qualitative inquiry about systemic and individual factors in medication-assisted treatment for opioid abuse, Hewell and colleagues (2017) reported findings supporting the construct of recovery capital (including personal recovery capital, family and social recovery capital, and community recovery capital), as well as suggesting the interactional relationship of such resources. They advised practitioners to be educated about multiple ecological influences and to be flexible in their approaches so as to utilize ever-changing sources of recovery capital available to their clients. The proposed counseling, teaching, and intervention strategies are an extension and elaboration of the eco-webbing model proposed by Williams, McMahon, and Goodman (2015). The authors described a strategy designed to facilitate more critical consciousness thinking in their students by creating visual representations of the factors and forces that may be affecting a client’s life and situation. Concept mapping strategies have been found to be powerful tools in creating visual representations of key factors affecting a client’s health and treatment needs (Gul & Boman, 2006) and in enhancing critical thinking. In Phase 1 of Williams and colleagues’ (2015) model, they ask counseling students to brainstorm all the variables related to a client’s problem. In the present model, we expand and structure this phase to include a systematic analysis of each of the system levels identified by Bronfenbrenner (1979, 1994) in order to create an eco-map. Phase 2 of the Williams’ et al. model (2015) involves the distillation of information and themes. We address this phase by utilizing Ungar et al.’s (2013) concept of differential impact. Ungar and colleagues assert that although Bronfenbrenner’s systemic levels are often visually represented as nested and hierarchal (i.e., levels closer to the center where the individual is more important), this structuring is merely a heuristic device, and that it is more useful to understand various systems and subsystems as reciprocal, having differential impacts at various moments and in various contexts. In the present model, we address Phase 2 by visually prioritizing different systemic issues and factors. As indicated in Figure 2, key factors from each of Bronfenbrenner’s systemic levels are illustrated by circles in the eco-map rather than in the traditionally nested manner. Based upon the client and counselor’s joint evaluation, many variables are included in the eco-map, with their current importance to the client represented by both relative size and distance from the center of the map. The final phase of the eco-webbing process, as described by Williams and colleagues (2015), calls for reflection upon the central issue and the multiple eco-systemic factors, and how these may inform the counseling process. Reflection upon the eco-webbing process itself is also encouraged. Our model expands upon these steps by using the information visually represented in the eco-map to structure and develop a formal treatment plan including both individual and systemic variables in the order and priority of their current effect on the client. Over the course of counseling, the eco-map can be revisited and restructured to represent the shifting centrality of various factors. For example, in an initial eco-map, access to a detox treatment center may be largest and at the center, while 6 months later, labor market or family relationship issues may enlarge and move toward the center. In the following sections, we present a client case study, suggest an ecological approach to understanding our client, and offer treatment strategies based upon our ecological conceptualization. Jason is a 37-year-old White male who lives in a southwest West Virginia town with a population of 30,000. Jason’s father and grandfather were both coal miners who worked hard, made a good living, and were active in the local community as church members and volunteer firemen. Jason had a happy childhood with no remarkable adverse events. He was a star of the high school football team. Having seen his grandfather die from black lung disease and his father suffer from emphysema, Jason vowed to never work in the mines. By the time he graduated high school, there were few mining jobs available. Jason began work for a concrete company, pouring concrete for residential and commercial projects. He was popular among his coworkers and relished working outdoors. At age 21 he married a young woman he had known since childhood and within 3 years they had two sons. After 10 years on the job, Jason was laid off because of the lack of new development in his town. Jason moved his young family to a larger town in Ohio to do concrete work for a commercial construction company. The working environment was very different, and Jason was required to take orders from contractors, rather than being in charge of each job as he had become accustomed to back home. Jason’s wife was very unhappy living away from their friends and family. After a few months, she and the children moved back to live with her parents. Jason visited on the weekends, but the arrangement strained their marriage, and within 2 years his wife filed for divorce. Around the same time, his father died from lung cancer. Jason had a number of back injuries over the years while working, but when he fell at home while moving a piece of heavy furniture, he herniated three discs and was restricted from many physical activities because of continuous pain. Because this debilitating injury occurred at home, Jason did not qualify for worker’s compensation benefits. He had surgery on his back and returned home with a prescription for narcotic pain medication. He did not comply with his doctor’s orders regarding physical therapy because as an hourly laborer, he could not afford any more time off work. Though the surgery did alleviate some of his pain initially, after a year it was clear that the operation did not fully repair his spine, and his pain again became unbearable. His doctor prescribed Percocet for him to take in the evenings when his pain was the worst, but over time, the medication became less effective. He visited a pain clinic near his apartment and received a prescription for OxyContin, which was stronger and long-acting. Jason noticed he felt less lonely and discouraged after taking the pills, which he began to do more often. Soon, Jason was not himself at work—making mistakes, forgetting things, and having conflicts with his supervisors. He was fired from his job. With no savings, outstanding medical bills, and being unable to work in his field, Jason returned home to live in a small house on his mother’s property. He applied for disability benefits and began receiving prescription opioids through a pain clinic in town. As his tolerance for opioids increased, he tried various strategies to avoid the horrific withdrawal symptoms he experienced when his supply of opiates ran out: crushing and snorting pills for a stronger effect, “borrowing” medication from family and friends, and buying additional pills from dealers. Nine months ago, the high street cost of pills led Jason to begin snorting heroin, which was cheaper, but more potent. Within 2 months, he began using heroin intravenously on a daily basis. Acquiring and using heroin became his primary endeavor, increasingly isolating him from his family and his group of lifelong friends. After showing up to church several times late and disheveled, Jason’s mother told him he was no longer welcome to join her in the family’s regular pew on Sundays. Last Friday, he met his ex-wife and younger son to attend his elder son’s first varsity football game as a family. In an effort to avoid becoming ill during the long game, Jason shot heroin in the parking lot and was visibly high when he entered the stadium. The evening ended with his ex-wife enraged, his younger son in tears, and his elder son saying he could not wait to go far away to college and never see Jason again. Two days ago, Jason’s mother found him unresponsive in his truck and called 911. EMTs administered naloxone (branded as Narcan), which restored his breathing after an accidental heroin/fentanyl overdose. He was taken to the hospital and referred to an outpatient community addiction and mental health clinic upon release. With no one in his family willing to pick him up from the hospital, and his mother saying she is unsure if she wants him to continue living on her property, Jason used a hospital bus pass to travel directly to a local substance abuse treatment facility. Individual: Traditional treatment focus. Assuming a disease model of addiction, a counselor would view Jason’s opioid dependence as primary, chronic, progressive, and potentially fatal (Angres & Bettinardi-Angres, 2008). As such, many substance abuse professionals would advocate that Jason’s addiction is the primary presenting problem and must be addressed first, before tackling other concerns and challenges. A treatment plan including goals and objectives focused upon enhancing his ability to remain abstinent from opioids and all other mood-altering substances should be developed, implemented, and monitored from the outset of treatment. It is essential for Jason to reduce his isolation by developing a social network supportive of his recovery efforts. Specific objectives to meet this goal might include attending daily 12-step meetings for a minimum of 90 days, obtaining a sponsor who has a minimum of 5 years in recovery, and reestablishing relationships with non-using childhood friends. An additional individual-level concern that must be addressed is Jason’s chronic pain from multiple herniated disks. During the first week of substance abuse treatment, Jason’s plan should include a complete physical examination with an emphasis on assessing pain level and spinal functioning, as well as HIV and hepatitis screening. Throughout his substance abuse treatment, Jason should receive psychoeducation via group work, lectures, reading materials, and videos or other media in order to enhance his understanding of the cyclic nature of pain disorders and opioid addiction. Jason also should make an appointment and establish a relationship with a medical specialist who is knowledgeable in both pain management and addictive disorders. Jason and this medical professional can develop an action plan to address his chronic back pain while minimizing his risk of opiate relapse. Acute fiscal concerns and the accompanying stress associated with lack of financial resources were identified as primary risk factors for relapse. Individual-level interventions should include connecting Jason with vocational rehabilitation counselors who will assist him in identifying personal and employment strengths, acknowledging limitations in the current job market, and assisting him in finding employment. Finally, in order to enhance the likelihood of success in his recovery, Jason should address issues of shame resulting from his drug use and loss of family, employment, health, and identity. While in treatment, he should receive extensive psychoeducation as to the meaning and significance of shame in the recovery process. Jason should be encouraged to discuss, in individual and group counseling, the complex nature of his drug use and related intra- and interpersonal consequences. Microsystem: Face-to-face interactions between individual and environment. Primary face- to-face interactions impacted by Jason’s addiction to opiates include communications with his ex-wife, sons, and mother. Although Jason’s marriage was negatively impacted by the family’s moving to Ohio, his use of prescription opioids following the move hurt his ability to communicate, restricted his interactions with his wife and children through gradual withdrawal from family events, and transferred parenting responsibilities to his wife. These changes in functioning within his nuclear family caused further alienation from others, including but not limited to his mother, friends, neighbors, fellow church members, and extended family. As a result of his opiate use, he no longer attended parent–teacher conferences at school and only sporadically appeared at his children’s baseball and football games. Having grown up in a small town, Jason was well known and well liked by many in his community. While working at the local concrete company in his home town, he had developed a tight-knit group of close friends, many of whom he knew from childhood. Upon his return to West Virginia following his loss of employment and injury while in Ohio, Jason no longer reached out to this group of friends. Instead, his primary focus became finding, paying for, and using opioids in order to avoid painful withdrawal symptoms. His social circle was nearly replaced by his drug dealer and occasional fellow heroin users with whom he would shoot up and share needles. It should be noted that all of the individual-level treatment concerns involve microsystem-level interactions between Jason and his environment. Jason’s counselor should be aware that achieving these goals will depend upon Jason’s pursuit or avoidance of interactions with various individuals, groups, and settings (i.e., the microsystem). This ecological awareness will increase the counselor’s understanding of the magnitude of Jason’s task, allowing for both deeper empathy and better planning. By highlighting the microsystem interactions required to pursue treatment goals, the counselor can help Jason become aware of the many variables in the environment he may not be able to control, thus emphasizing the importance of remaining steadfast regarding those elements of his treatment and life in which he does have power and choice. Mesosystem: Interactions between two or more environments where an individual exists. In Jason’s West Virginia and Ohio communities, there were several changes in economic and medical systems that impacted his use of opiates. The shutting down of coal mines and businesses associated with the coal industry (housing, rail transportation, and facility maintenance provision) made a significant economic impact on communities and extended to multiple industries outside of mining. New houses were not being constructed, and local small businesses began to struggle and disappear. As a result, the need for concrete diminished and Jason’s boss was forced to lay off workers. Families like Jason’s were faced with a difficult choice: remain in a community in which they and multiple generations before them had lived and hope jobs would one day return or uproot their families in search of employment opportunities elsewhere. Many families chose the latter—which left the small town void of human resources and an adequate tax base from which to provide municipal and human services. Jason’s long-term treatment provider should take into account employment opportunities within the community and assess if Jason has adequate training for today’s workforce. Vocational rehabilitation counseling is recommended to assess his skills and to determine if further education is needed. All of the local helping service providers (e.g., medical, addictions, mental health, vocational, and school professionals) in Jason’s town are overwhelmed because of high needs and dwindling financial resources. As such, Jason’s counselor must be aware of mesosystem-level obstacles; these interactions between microsystems may be fraught because of the challenges being experienced in each system. For example, the process of one facility making a referral to another can be difficult because of high demand and a lack of resources in either system. For clients like Jason, already struggling with shame and disenfranchisement, a mesosystem-level challenge might be taken personally and be potentially triggering. A counselor working with Jason through an ecological lens could engage with him regarding such an obstacle, and draw parallels to other system-to-system interactions that have affected him (e.g., how decline of coal is impacting other economic opportunities in his town; how the influx of cheap heroin is impacting hospitals, treatment centers, and neighborhoods). As mentioned above, increasing a client’s awareness as a person in a system may help create more accurate assessments of the forces at play within the respective environments. Exosystem: Interactions between two or more environments, at least one of which does not include the individual. In addition to the economic shifts noted in the previous section, important changes in the way pharmaceutical companies marketed prescription opioids to both consumers and medical providers impacted the availability of these narcotics in the communities where Jason lived. Jason was told by physicians that the drugs he was prescribed carried a very low risk of addiction and was given documentation supporting the effective and safe use of Oxycontin as a treatment for pain (Van Zee, 2009). Jason was not aware that his physician had attended an all-expenses-paid pain management conference at a Florida resort, hosted by Purdue Pharma, or that his doctor had been invited to become a speaker for the company. He also was not aware that his physician was being tracked by Purdue as a frequent prescriber of OxyContin and thus receiving increased attention and gifts from their regional sales representative, who was eagerly pursuing an annual sales bonus that could more than double her salary. These distal variables had a profound effect on Jason as an individual, along with many other examples in the mesosystem: his Ohio boss’s enforcement of company policies regarding drug use and addiction; health care policies about prescription opiates, addictions treatment (including medication-assisted therapies), and insurance for people with pre-existing conditions; drug traffickers contaminating heroin with fentanyl and pushing an influx of heroin into Jason’s vulnerable community; and state and local policy regarding the availability and administration of naloxone—which likely saved Jason’s life. If Jason’s counselor views Jason and the helping process through an ecological lens including such variables, both counselor and client will be better prepared to co-construct a treatment narrative around the past, present, and future that draws upon Jason’s strengths and recognizes his limitations within the realities of a complex system. Macrosystem: Cultural, political, economic, societal backdrop. Jason’s current circumstances have unfolded against a multifaceted socio-political backdrop, influencing many clinically salient factors in his treatment. The economic decline of his hometown is not isolated, but rather part of global trends related to the urbanization of wealth and resources. There has been a marked decline in well-paying blue-collar jobs with benefits, overall economic dislocation due to automation, and an increasing need for advanced education in order to be competitive for open positions. Technology has increased the breadth and depth of information available to the average American, and those who cannot afford access to technology fall further and further behind. With access to information about opportunities available elsewhere, young adults from small rural communities increasingly leave areas their families may have resided in for multiple generations. Religious authority and institutions have declined, and the purpose and services churches traditionally provided in rural areas have also eroded. State- and federal-level health care policy, pharmaceutical industry regulations, scientific progress in the fields of pain management and addiction, and changing norms in our cultural understanding of addiction, treatment, and outcomes are all at play in the macrosystem. As part of Jason’s long-term treatment, psychoeducation and client-centered processing regarding these and other macrosystem variables can support multiple treatment goals, particularly those related to issues of shame. Placed within a broad ecological context, Jason’s feelings of anger and shame can be normalized while facilitating a shift from a personalized focus (e.g., “I am bad,”) to a broader perspective (e.g., “These are difficult times, and new skills I never had the chance to learn before are needed for survival”). Chronosystem: Historical context and changes in environments over time. In developing a comprehensive treatment plan, along with the systems already outlined, the ecologically sensitive counselor should help Jason plan for challenges that are likely to occur over time as a result of his developmental process, along with the historical moment in which Jason lives. He is 37 years old and still in the first half of his working life. He has adolescent children who will be growing into young adulthood; they may look toward him for guidance or choose to challenge and reject him. This moment in time is a developmentally critical one for Jason’s family. At the time of writing this article, the United States is in the midst of a number of policy debates that will have an enormous effect on Jason’s life and health (Kessler, 2018). Long-term funding and access to health care is a contentious and unsettled issue. Ecologically aware counselors should both monitor and engage in the unfolding policy debates related to the funding of substance abuse treatment and other ongoing services Jason and clients like him need now and in the future. Furthermore, economic trends toward clean energy, globalization, technology, urbanization, and higher education continue to accelerate; the world is already a different place than when Jason first started working, or when he first started using drugs as a means to cope with pain. Jason and those seeking to help him must have accurate, up-to-date knowledge of how industry trends are impacting local and regional sectors, and devise strategies to engage and compete in the current economic environment. Although vital, it is not enough for Jason’s counselor to help him survive only in the present moment. The counselor should anticipate future challenges Jason will confront and assist him in mapping out a sustainable, long-term plan. Such a plan will normalize the influence of both individual- and systems-level variables, emphasizing the importance of multiple sources of support, maintenance of his sobriety, and the inevitability of confronting both developmental and historical challenges. Just as a person with progressive multiple sclerosis needs to anticipate their future medical and assistive technology needs, so does Jason need to identify and plan for his future health, wellness, and economic needs within our rapidly changing society. An ecologically sensitive counselor understands both Jason’s personal development and larger historical trends, and is thus able to advocate for Jason’s preparation to survive and thrive over time. Over the past few decades, the counseling profession has increasingly recognized that advocacy is a vital component of the counselor’s role (Chang, Barrio Minton, Dixon, Myers, & Sweeney, 2012; Ratts, Toporek, & Lewis, 2010). Counselors are ethically required to understand their clients in a deeply contextualized manner and have a responsibility to try and reduce social and ecological barriers that may be blocking their clients’ growth, development, and flourishing, and exacerbating their clients’ mental and physical health challenges. Understanding the pivotal role ecological factors play in clients’ health, relationships, and careers has long been central to the field of rehabilitation counseling (Parker & Patterson, 2012). Issues such as accessibility and universal design were recognized as central to the success of people with disabilities, just like evidence-based treatments. For example, if a client who uses a wheelchair is seeking to participate in a program or obtain a job requiring access to a particular building, and that building lacks accessible parking or public transportation, curb cuts, and an accessible entrance and bathroom, the client is likely going to be blocked from reaching goals. Such systemic, advocacy-oriented thinking can be applied to the current opioid crisis. As described in the previous sections, using Bronfenbrenner’s ecological model and creating an eco-map as a tool in the client conceptualization process led to the identification of a wide range of variables related to Jason’s treatment and recovery. Counselors need both awareness of and knowledge about factors affecting their clients at multiple systemic levels. Advocacy as understood within this model includes understanding labor market trends and participating in public policy discussions concerning support for workers displaced by globalization and automation. It means working to obtain more medical resources and treatment centers for clients struggling with addiction, striving to change laws to emphasize treatment over incarceration, and providing more access to life-saving medications such as naloxone. In short, the pursuit of social justice and counselors’ roles as advocates are intrinsic in this model of conceptualization and intervention, highlighting the clinical and societal relevance of a broad range of systemic variables and public policy debates. One area in which counselors can advocate for the improved access to services for those struggling with opioid use is through supporting programs, such as the Mental Health Facilitator program (Hinkle, 2014), aimed at training laypersons with the basic skills to identify, briefly intervene with, and refer people in their communities who are experiencing a mental health crisis. The increased presence of persons with such skills in the microsystem—in schools, hospitals, faith communities, businesses, and neighborhoods—creates opportunities for detection, referrals to treatment, and life-saving emergency interventions, particularly among underserved populations. Mental Health First Aid is an international, evidence-based, 8-hour training course that teaches community members steps they can take if they encounter a person who is having an emergency, such as having suicidal ideation, a panic attack, or an overdose. Mental Health First Aid has recently added opioid-specific overdose training and naloxone administration to their curriculum (Pellitt, 2018). Ecological thinking is a powerful skill, and one we argue is necessary for clinically competent counseling. The ecological conceptualization and treatment planning process outlined in this article is designed to provide a structured and systematic template for helping counselors identify clients’ complex needs, as well as the many influential variables at play in the past, present, and future. Engaging from an ecological perspective requires counselors to understand their clients as embedded in multiple systems. Further, it calls upon counselors to develop a deep understanding of the social, economic, and political contexts in which their clients live, and to develop systemic intervention skills. Utilizing this model in clinical settings could enrich the lives of clients, who may come to embrace a more nuanced and inclusive way of conceptualizing themselves and their environment. Counselors-as-advocates are inherent in this model, and those professionals who espouse ecological thinking cannot ignore the multitude of powerful forces that either enhance or impede our clients’ well-being. Clinicians who understand and engage with their clients through this lens may find that ecological psychoeducation can lead to clients-as-advocates as well. Clients who come to understand themselves and others as people in environments may find their individual-level goals are supported and enhanced by goals associated with learning about and eventually acting upon systems-level variables in their lives, thus increasing the recovery capital (Hewell et al., 2017) available to them within their own environments. Attention to the American opioid epidemic is increasing based on advocacy by citizens, journalists, public servants, and health professionals. As focus and resources are directed to this complex problem, ecologically informed interventions by stakeholders in all of the interconnected systems are advised to both save and improve lives now and in the future. Bronfenbrenner, U. (1994). Ecological models of human development. In M. Gauvain & M. Cole (Eds. ), Readings on the development of children (2nd ed., pp. 37–43). New York: Freeman. Chang, C. Y., Barrio Minton, C. A., Dixon, A. L., Myers, J. E., & Sweeney, T. J. (Eds.). (2012). Professional counseling excellence through leadership and advocacy. New York, NY: Routledge. Kolodny, A., Courtwright, D. T., Hwang, C. S., Kreiner, P., Eadie, J. L., Clark, T. W., & Alexander, G. C. (2015). The prescription opioid and heroin crisis: A public health approach to an epidemic of addiction. Annual Review of Public Health, 36, 559–574. Kosten, T. R., & George, T. P. (2002). The neurobiology of opioid dependence: Implications for treatment. Science & Practice Perspectives, 1, 13–20. Parker, R. M., & Patterson, J. B. (Eds.). (2012). Rehabilitation counseling: Basics and beyond (5th ed.). Austin, TX: Pro Ed. Peltz, P. (Director). (2017). Warning: This drug may kill you. [Motion picture]. United States: HBO Documentary Films. framework for counselors. Alexandria, VA: American Counseling Association. Rudd, R. A., Seth, P., David, F., & Scholl, L. (2016). Increases in drug and opioid-involved overdose deaths—United States, 2010–2015. Morbidity and Mortality Weekly Report, 65, 1445–1452. Jennifer L. Rogers, NCC, is an assistant professor at Wake Forest University. Dennis D. Gilbride is a professor at Georgia State University. Brian J. Dew, NCC, is an associate professor at Georgia State University. Correspondence can be addressed to Jennifer Rogers, P.O. Box 7406, Winston-Salem, NC 27109, rogersjl@wfu.edu.